Watch The 360 Video Now! Meet the patent-pending design that is poised to revolutionize your closet organization needs! Make organizing your shoes, clothing and accessories easy and convenient with the 360 Organizer® rotating closet system. This innovative design uses a rotating mechanism to allow for easy and quiet rotation while dramatically increasing storage space. 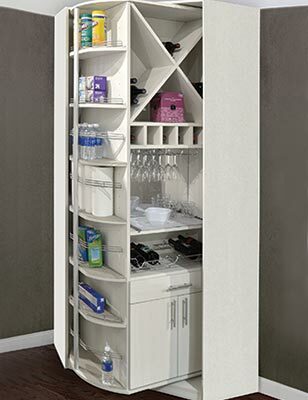 The 360 Organizer® is perfect for closets, pantries, wine storage and much more! 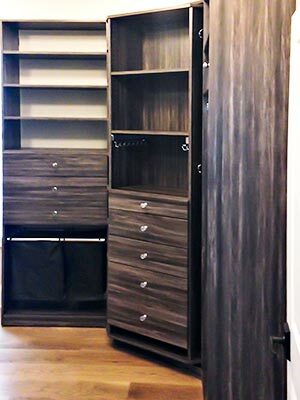 It can be made with drawers, shelves and hanging rods as well for a fully customized closet — it can be used alone as a freestanding unit or integrated into a full closet organization system. It comes in four standard configurations, "The 360 Double Hang", "The 360 Shoe Spinner", "The 360 Valet," and "The 360 Pantry" but is also available in a multitude of custom configurations. 360° rotation is achieved by manual rotation of the unit. 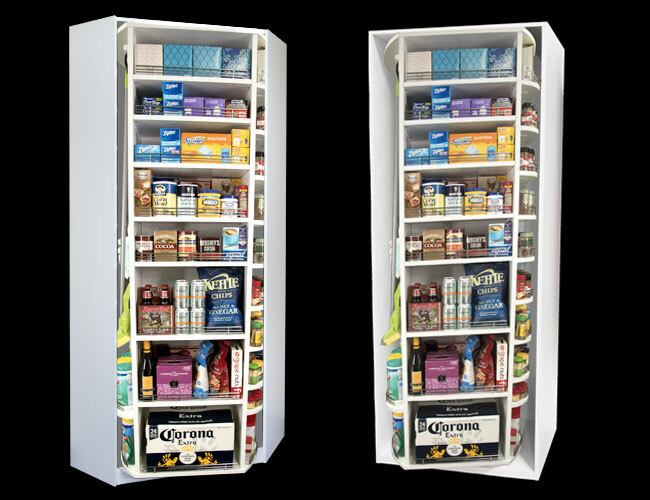 The 360FS Series is a freestanding model which can be set into a full closet system or used as standalone storage. The 360 Built-In model is designed to spin within a cabinet which easily attaches and integrates into the corner of a larger closet system. The 360 Organizer® is available in four configurations and over 45 colors. The shelves are also adjustable to accommodate all types of unique storage. 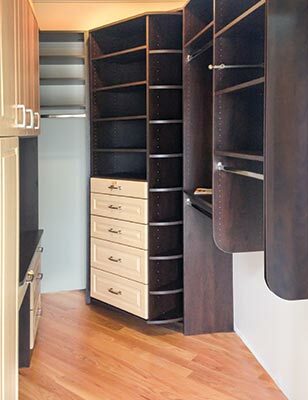 The 360 Organizer® is perfect for closets, pantries, wine storage and so much more! Can hold up to 200 pairs of shoes — Isn't that amazing? Click on any picture below for additional information about the 360 Organizer® products. This room is part of a home chosen for the Lake Forest Showhouse & Gardens house walk benefiting the Infant Welfare Society of Chicago. 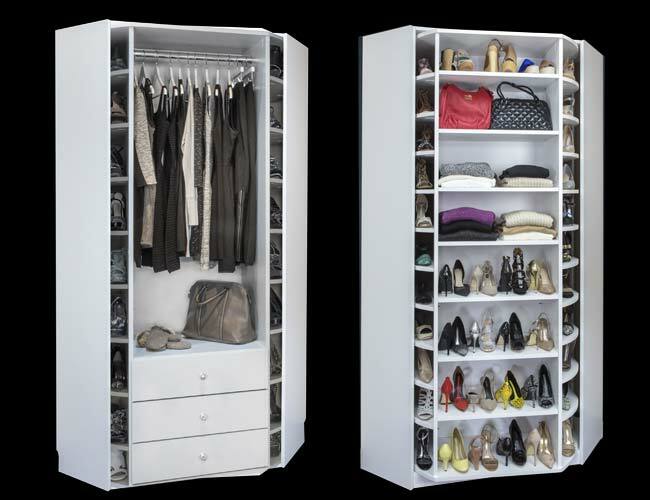 Closet Works closet organization systems include the 360 Organizer® in standard shoe spinner configuration shown in white laminate finish, plus the custom drawer unit and cabinets also in white with Shaker Mission doors and drawer fronts. 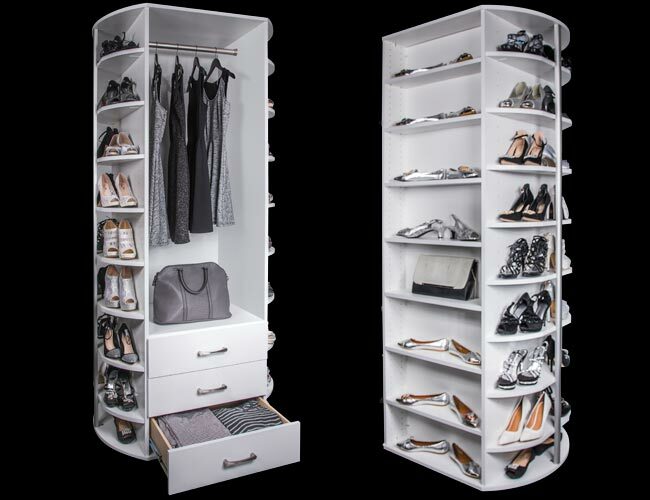 This custom closet organization system includes an efficient wall mount hanging system, and the 360 Organizer® to handle the shoes and shelving needs. All closet organization pieces coordinate with the existing home decor and are done in a dark slate laminate. The 360 Organizer® in Valet configutration offers drawers, hanging space, deeper shelves and room for other accesories like a mirror. This unit sports designer series round knobs in Swarovski crystal. 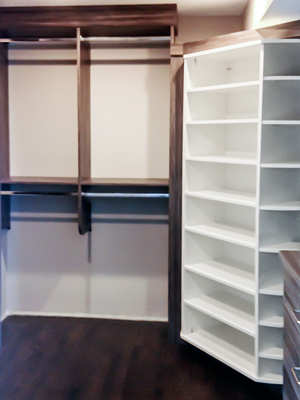 The white laminate compliments the rest of the Closet Works custom closet design in Breakwater gray. 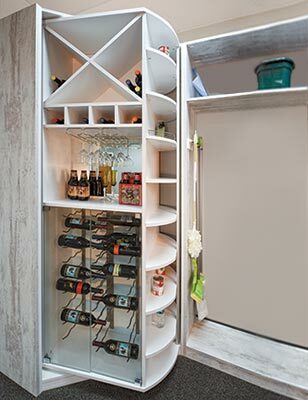 This 360 Organizer® pantry installation is configured to hold wine and beverages. The addition of a beverage cube accessory, wine glass holders and wine bottle rack behind glass doors allow this pantry organizer to function as a full-service bar. This 360 Organizer® is white, surrounded by Memento laminate case and shelves. This 360 Organizer® valet installation is configured with 4 drawers featuring raised panel fronts, plus 4 deep shelves in addition to the shoe storage on the sides of the unit. Long, bar style handles in polished chrome compliment the vertical lines in the reeded glass doors of the accompanying wardrobe unit for a beautiful, unique, yet thoroughly functional closet system. Including two 360 Organizer® units and personalized accessories, this arrangement is a treat to oneself. Storage capability is seemingly endless and the exclusive features such as pull-out sweater shelves, pull-out jewelry dividers, slack pull-out and a tilt-out hamper make the absolute most out of the space. 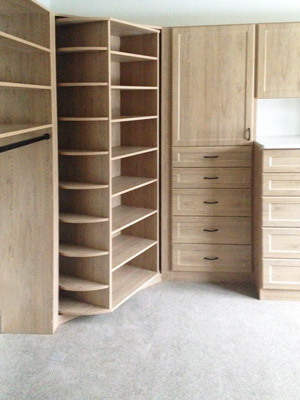 A closet hutch is incorporated into the design as a replacement for an island, which includes drawer and cabinet systems for smaller and folded items. 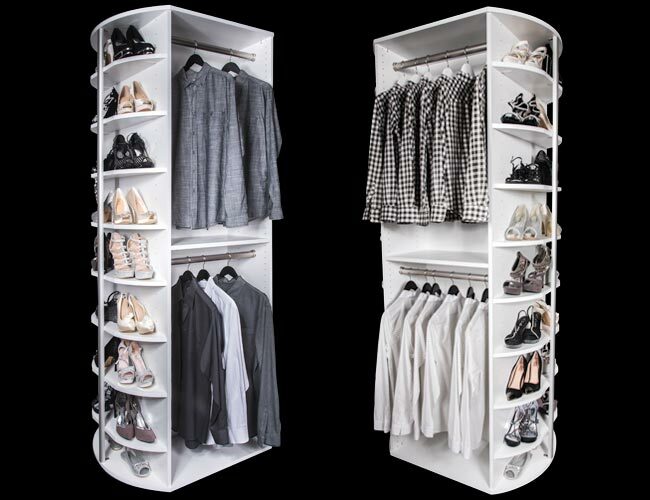 This 360 Organizer® in valet configuration would be a stand out winner in any custom closet. 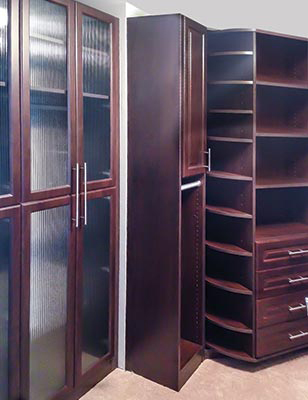 The creative use of a dark wood tone laminate with light tone accent drawer fronts customize this installation in a unique way and blends the entire this custom, walk-in closet system with the look of the rest of the home. How could anyone get ready in a closet like this without feeling polished and put-together? 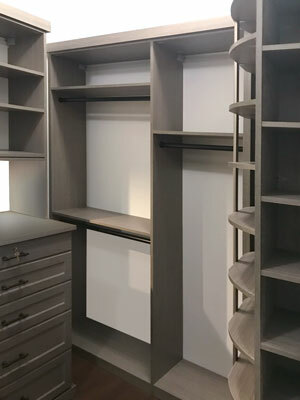 The sophisticated balance of neutral gray and white tones of this 360 Organizer® in shoe spinner configuration turns this custom closet design into a functional piece of art. The chrome and crystal accessories are cool and refreshing with a thoroughly modern aesthetic. This pantry puts every inch of space into useable storage! This 360 Organizer® builds on the standard Valet configuration with additional accessories to outfit the unit as the perfect pantry. Wire baskets for root vegetables or bagged items like chips keep big things in their place. Pull-out drawers and a pull-out spice rack organize the small stuff. Trays stay neat and tidy with the vertical tray divider on the top shelf. All items, even those stored in the back and in the corners, are easily accessible when the 360 Organizer® is installed. 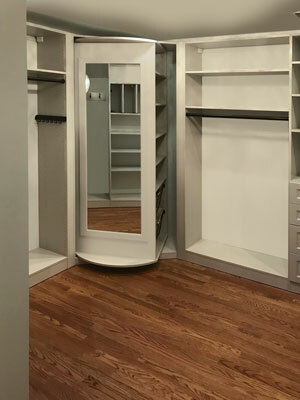 The corner installation of the 360 Organizer® Shoe Spinner pushes this closet over the top when it comes to functional storage in a space that provides only 18 linear feet for closet components. With the additional elegance and beauty from the center island and hutch unit with reeded glass doors, this closet packs a lot of punch in a relatively small space. The rotating Shoe Spinner is definitely the The pièce de résistance, able to organize between 85 and 200 pairs of shoes in the corner of the closet. 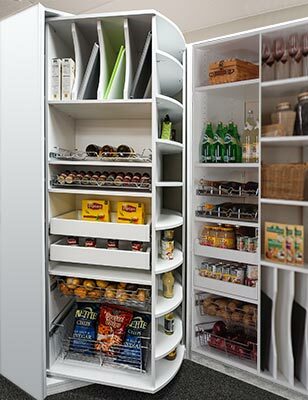 The 360 Organizer® Butler's Pantry! 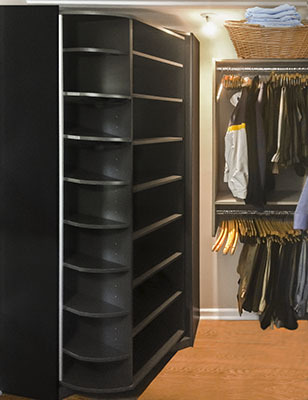 This 360 Organizer® doesn't need to be hidden behind closet doors. Configured as a butler's pantry with an attractive custom cabinet and drawer unit, it sits in a corner and offers quick and efficient access to the client's entertaining needs. A wine cube, plus pull-out wine rack and undermount wine glass holder ensure efficient storage with easy access to bottles and serving pieces. 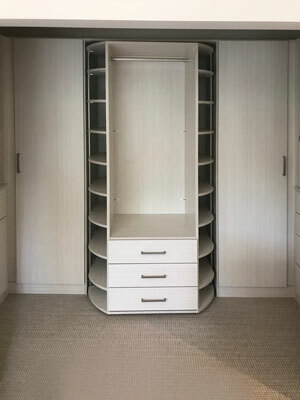 This closet design is not only pretty, but utilizes every inch of available space to pack in a lot of storage. 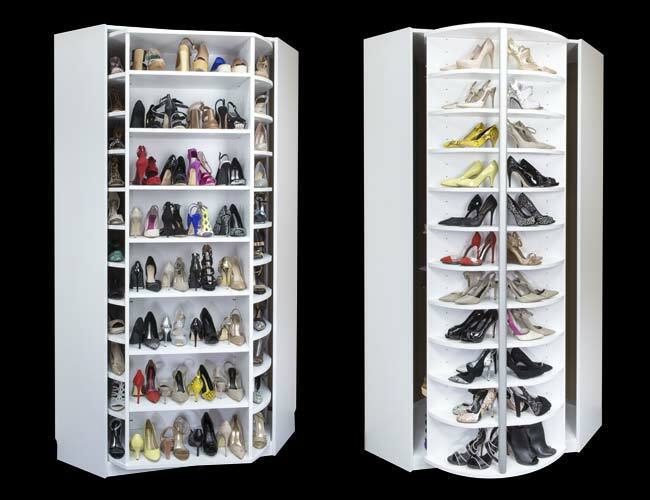 The 360 Organizer Shoe Spinner rotating closet occupies one corner, holding up to 200 pairs of shoes. 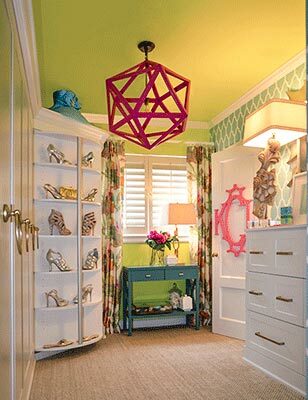 Extending the hanging space up to the ceiling allows for longer items in the double hang section. A pull down rod provides easy access. Numerous organization pull-outs were included for ties, belts and pants — allowing the maximum number of items to be kept in the minimum of space. This all-encompassing design accommodates organization with its elemental features such as cabinets, drawers, a hanging rod, shelves, and the special 360 design fufilling the shoe lover's dream. The arrangement conserves a pivotal amount of space in which it wraps around the room making this closet as comfortable as possible. This closet organization system not only includes two pull-out hampers, plenty of drawers and shelves plus the ultimate closet organizer — the 360 Organizer® Valet model customized with five drawers and even more shelving to maximize storage. The entire closet wears an elegant cocoa bean laminate complimented by brushed chrome knobs, offering a timeless look that will always be in style. A 360 Organizer® Valet model fits nicely into the corner of this master bedroom closet, offering 360 degrees of manually rotating storage. The 360 Organizer® nearly doubles the storage space in that corner. The crescent shaped shelves along the sides can hold up to two pairs of shoes each, while the shelves on the backside can hold four pairs of shoes per shelf. The front of the Valet model shows a custom configuration, with four drawers instead of the standard three, and more shelves rather than the usual hanging rods. This organization system keeps it clean and straighforward. There are plenty of hanging rods, drawers for folded clothes, and the remarkably unique 360 organizer. Vital for the shoe collector but not limited to footwear, other accessories such as purses and clutches can be stored in this unit. Its lavish and rich woodwork contrast beautifully with the white spinning organizer. 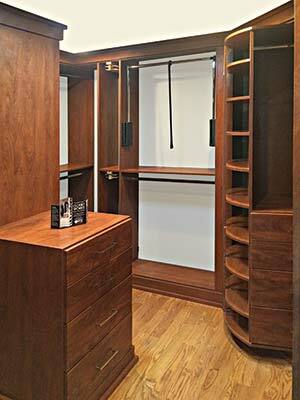 This walk in closet design displays how a 360 Organizer can be customized to perfectly fit your needs. This Valet model has been outfitted with a full-length mirror and canvas-lined baskets. 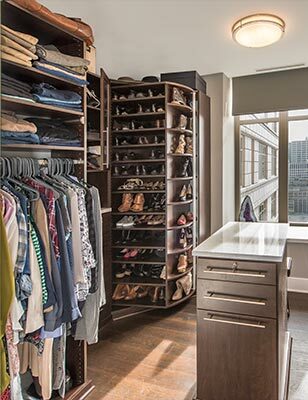 This walk in closet design has a 360 Organizer Shoe Spinner model constructed using a Haze laminate — a step beyond standard white. * All content used on this website, including images, is the property of Closet Works and is subject to copyright.